MSI late November released BIOS updates for its entire range of socket AM4 motherboards, mainly to include AGESA 1.0.0.6, which improves memory compatibility. The updates also pack various motherboard model-specific fixes. Apparently there has been a goof-up with this update (not in a bad way, though). The latest BIOS updates "accidentally" unlock the otherwise locked Athlon 200GE dual-core processor with integrated graphics. No, you won't get more cores or iGPU stream processors, but the base-clock multiplier letting you easily overclock the processor is now unlocked. This adds value to the $55 processor, given that competing Celeron and Pentium Gold SKUs are overpriced in the market these days. In their overclocking adventures with the 200GE paired with a MSI B450 Gaming Pro Carbon AC motherboard, TechSpot observed that the chip (which is clocked at 3.2 GHz by default) wouldn't POST beyond 3.90 GHz, and that you need vCore at 1.4 V to sustain even 3.90 GHz. They found 3.80 GHz at 1.35 V to be 100% stable (an 18.75% overclock). The memory clocks are still restricted to DDR4-2666, although you can still play with timings. I wish more vendors would goof up more often. SkyOC was a nice goofup, and i wish people could overclock their locked Intel chips, as well as unlocked chips on non Z chipsets from time to time. Until then, modding motherboards and CPUs will still have to take a significant part in some small communities. Didn't GN already confirm that while you can change the multiplier, the actual speed and performance do not change at all? So really all they did was expose an option menu that does not work. I guess clicking on the source link took too much effort? If you had, you would've seen that there was a performance increase, maybe not earth shattering, but enough to make it worth while. GN was able to squeak a 3.9 GHz OC on their chip. Pretty impressive for a $55 chip. Steve@GN even mentioned the BIOS would be available, from them, if MSI "fixes" this. Since there is no putting the cat back in the bag. Are the rest of the mobo makers going to just unlock this as well is what I am wondering. 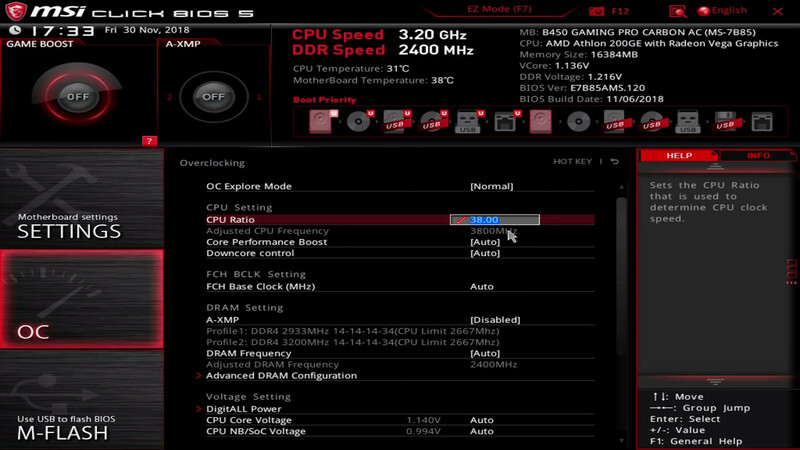 Just a heads-up, the latest F3d BIOS on the Gigabyte B450M DS3H also enables overclocking on the 200GE. With stock voltages, I am 100% stable at 3.775GHz (as compared to the stock 3.2GHz at a -0.102V offset). According to HWiNFO, an AVX stress test at 3.775GHz allows the CPU to draw around 60W; this is compared to around 42W at stock. I guess that answers my question and is exactly what I expected. My guess would be ASRock will be next followed by ASUS.